The iconic 40th birthday deserves an iconic birthday present and Kennels Cottage can offer you just that with our Mini Tour of Scotland Package. Born in the 1970’s, you might just remember the cars of your early years. Here’s your chance to relive an age of change, carefree days and hope for the future. Our cars give you back a time that evokes smiles from everyone you pass. 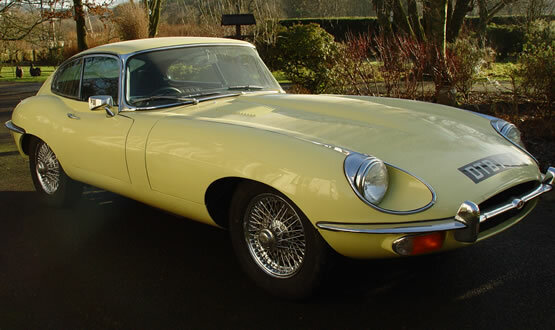 It’s a fantastic feeling behind the wheel of a classic car, the roar of the engine, the wind in your hair, just watch the reaction on peoples faces as a gleaming E-Type glides through the countryside. You can’t beat Scotland for driving, it’s the perfect place to put your foot down and actually get somewhere. Fabulous unspoilt scenery, castles, mountains and lochs you name it Scotland has it! Enjoy great lunches and dinners after all that fresh air you’ll be ready to taste what Scotland has to offer. Recreate the magic of an Agatha Christie film and hire our hand built Morgan 4/4 a moment of the 1930’s, pretty as a picture and fun to drive. Scotland is the ideal place to spend your 40th birthday, a classic car, no traffic jams, and miles of empty roads to enjoy. The most stress free few days you will have spent in ages. We are easy to get to, 40 minutes away from Edinburgh Airport, 1 hr away from Glasgow Airport. We can organise taxi transfers at preferential rates and organise dinner reservations for you. All you need to do is arrive and we’ll do the rest.